Bacillus stearothermophilus 9 strain has been found during screening of bacteria from natural sources which produces a new site-specific nickase N.Bst9I. This enzyme recognizes and cleaves nucleotide sequence 5'-GAGTCNNNN^-3', so it is an isoschizomer of N.BstSEI endonuclease found earlier. But enzymatic properties of both enzymes are considerably different. N.Bst9I application in genetic engineering and biotechnology is more preferable because its "star" activity is much lower in comparison to N.BstSEI. Site-specific nickases (SSN, N.) present a new class of DNA-cleaving enzymes. Unlike related restriction endonucleases causing ruptures in both chains of the DNA molecule, these enzymes hydrolyze only one chain of a duplex DNA. Only a few representatives of this class are known while a large group of restriction endonucleases including more than 3300 enzymes has been described . This work is devoted to the detection of a new site-specific nickase BstSEI  and the comparison of the properties of the two enzymes. The screening of bacterial strains was performed according to a modified method . 20-30 mg of cell biomass grown on agarized L medium was suspended in 200 μl of a lysing mixture containing 20 mM tris-HCl, pH 8.0, 0.1 μg/ml of lysozyme and 0.01 % of Triton X-100. After incubation for 15 min at room temperature, 2 μl of the obtained lysate was added to 20 μl of restriction buffer with the DNA (10 mM tris-HCl, pH 7.6, 50 mM NaCl, 10 mM MgCl2 and 50 μg/ml of phage lambda DNA). The reaction was conducted for 1 h at 55° (for cell lysates of thermophilic strains) or at 37° (for cell lysates of mesophilic strains). The DNA was precipitated with two volumes of ethanol; the precipitate was dried for 10 min and resuspended in 10 μl of buffer S1 (30 mM sodium acetate, pH 4.5, 50 mM NaCl, 0.1 mM ZnCl2). After adding 0.1 activity units of S1 nuclease, the mixture was kept for 15 min at 37°. The reaction products were separated by electrophoresis in 1% agarose in tris-borate buffer. The characteristic of the producer strain. The strain was isolated from water and soil samples from Medvezhye hot spring in the vicinity of the Mutnovsky volcano in Kamchatka. The strain cells present mobile rods (0.6x(3-6) μm) forming elliptical spores (1.5x2.5 μm), which are located terminally and swell sporangia. The cells are gram-positive though they weakly retain staining. The strain is aerobic, catalase-positive and grows at the temperatures from +40 to 65°. The species was identified according to the classifier  as a strain of bacterium Bacillus stearothermophilus 9. The strain cultivation was performed at 55° on a medium, pH 7.7. The nutrient broth contained 1% trypton (Organotechnie, France), 0.5% yeast extract (Organotechnie, France), 0.1% MgCl2·6H2O and 0.001% thiamine. The overnight culture (1 L) was placed into a fermenter (New Brunswick, USA) in 20 L of the broth and grown for 4 h at air aeration (15 L/min) and agitation (300 rev./min) up to 3 units of optical density at 550 nm. 86 g of cells was deposited by centrifugation and stored at - 20°. N.Bst9I isolation was performed at 4°C. All solutions contained 10 mM K-phosphate buffer, pH 7.3, 7 mM mercaptoethanol and 0.1 mM EDTA. 8 g of cells were disintegrated by ultrasound in 50 ml of 0.1 M NaCl and clarified by centrifugation at 20,000 g for 1 h. The extract was applied to a column (1.5x10 cm) of heparin-sepharose (Sigma, USA) and rinsed in 0.1 M NaCl; the enzyme was washed off in the gradient of NaCl concentration (0.1-0.8 M). The gradient volume was 200 ml. From 25 fractions # 13-15 were collected and applied to a hydroxyl apatite column (2x3 cm) and rinsed in 10 ml; the enzyme was eluted in the gradient of K-phosphate buffer from 0.01 to 0.4 M. The gradient volume was 100 ml. From 50 fractions # 42-46 were collected, applied to a column (0.9x6 cm) of phosphocellulose P-11 (Whatman, England) and rinsed in 0.2 M NaCl; the enzyme was washed off in NaCl gradient from 0.2 to 1 M. The gradient volume was 60 ml. Fractions # 35-40 were collected, dialyzed against 50% glycerol +0.2 M NaCl and stored at -20°C. 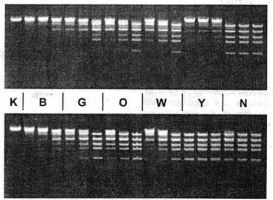 The evaluation of the preparation purity was performed with the following three tests used to determine the quality of restriction endonuclease preparation. 1. Incubation with the DNA overnight. One and 2 μl of the enzyme preparation was added to 1 μg of phage T7 DNA (see below) and incubated overnight at 55°. After electrophoretical separation of hydrolysis products, no substantial smearing or weakening of bands corresponding to Bst9I DNA fragments was observed, which indicates the absence of considerable levels of nonspecific endonucleases in the preparation. 2. The restriction - ligation - restriction test. The phage T7 DNA was cleaved by 5-fold excess of SSN Bst9I, and ligation of the obtained fragments was performed with the DNA ligase of phage T4, which resulted in the reconstruction of substrate molecules. The recovered DNA was again subjected to hydrolysis with N.Bst9I preparation. The course of reactions of ligation and repeated DNA cleavage is indicative of the intactness of the ends of the fragments forming at treatment with the enzyme preparation. 3. Test on oligonucleotide substrates. 5'-γ-32P-labeled oligonucleotide and its duplex containing an unlabeled complementary chain were used as substrates. 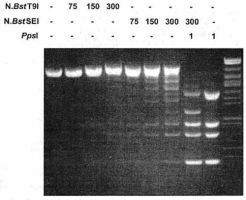 The substrates were treated with 1 μl of N.Bst9I enzyme preparation for 4 h under optimal conditions; electrophoresis was performed in PAAG under denaturing conditions, and the gel was autoradiographed. The absence of additional bands and a decrease in the spot intensity as compared with the control (the same substrates not subjected to treatment) indicate the absence of considerable levels of phosphatases, endonucleases and nonspecific endonuclease activity in the preparation. Each chain was labeled at the 5'-end using T4 polynucleotide kinase and γ-32P-ATP (4 Ci/mmole, closed JSC "Biosan", Novosibirsk) and hybridized with an unlabeled complementary chain. Thus obtained labeled modification of the duplex were cleaved by endonucleases, and the fragments were separated by electrophoresis in 20% PAAG with 6 mM urea. Heat inactivation of nickases. Twenty enzyme activity units were added to 20 μl of optimal buffer with 0.5 μg of calf thymus DNA. The mixture was incubated for 20 min at 65° or 80°C after which it was supplemented with 0.5 μg of phage T7 DNA and incubated for 1 h at an optimal temperature. The determination of optimal conditions for the activity was performed using a set of 6 restriction buffers ("SibEnzyme Ltd.") of the following composition: buffer B - 10mM tris-HCl, pH 7.6, 10 mM MgCl2 and 1 mM dithiotreitol (DTT); buffer G - 10 mM tris-HCl, pH 7.6, 10 mM MgCl2, 50 mM NaCl and 1 mM DTT; buffer O - 50 mM tris-HCl, pH 7.6, 10mM MgCl2, 100 mM NaCl and 1 mM DDT; buffer W - 10 mM tris-HCl. PH 8.5, 10 mM MgCl2, 100 mM NaCl and 1 mM DDT; buffer Y - 33 mM tris-acetate, pH 7.9, 10 mM magnesium acetate, 66 mM potassium acetate and 1 mM DDT; buffer N - 10 mM tris-HCl, pH 8.5, 10 mM MgCl2 , 100 mM KCl, 1 mM DDT, 0.1 mg/ml of BSA). Phage T7 DNA (1 μg) and a certain amount of the enzyme preparation were added to 50 μl of the buffer, mixed and incubated for 1 h at 55° and 65°. The reaction products were separated by electrophoresis in 1% agarose in tris-borate buffer. Full specific cleavage of 1 μg of phage T7 DNA within 1 h under optimal conditions was taken as an activity unit of N.Bst9I. The enzyme and DNA preparations used in the work were manufactured at "SibEnzyme LTD" (Novosibirsk). The screening of bacterial strains was performed using phage lambda DNA and nuclease S1 capable of hydrolyzing the DNA in the sites of single-chain ruptures (see "Experimental conditions"). A SSN producing strain was detected in the course of screening. The microbiological properties of the detected strain 9 are typical of representatives of the species B. stearothermophilus . In accordance with the nomenclature, the new nickase was named N.Bst9I. The enzyme N.Bst9I was purified from 8 g of biomass by destroying cells with ultrasound followed by purification of the enzyme with column chromatography. The preparation of the new nickase Bst9I was produced after three stages of chromatographic purification on heparin-sepharose, hydroxyl apatite and phosphocellulose. The yield of the enzyme N.Bst9I is 32,000 activity units per 1 g of the cell biomass. The subsequent tests demonstrated the suitability of this preparation for molecular biological experiments. The isolated enzyme was found to hydrolyze the DNAs of phage T7 of and adenovirus-2 in the same way as the previously described nickase BstSEI with the recognition site 5'-GAGTC-3' and, therefore, is its isoschizomer. 3'-C T C A G N N N N N N -5'. Fig. 1. Determination of the site of the DNA cleavage by the enzyme N.Bst9I on an oligonucleotide duplex: The duplex contains a labeled upper (1-3) or lower (4) chain. 1 - after treatment with N.BstSEI; 2 - after treatment with E.coliendonuclease III (fragment length marker); 3-4 - after treatment with N.Bst9I. In spite of the identity of recognition sites and the DNA hydrolysis site, site-specific nickases Bst9I and BstSEI differ in biochemical properties. N.Bst9I is a more thermostable enzyme as it is not inactivated as a result incubation at 65° for 20 min while N.BstSEI fully loses its activity in such treatment. Both enzymes can be inactivated by heating to a higher temperature - 80° within the same period (Fig. 2). Fig. 2. T7 DNA digestion after heat inactivation: 1-2 - N.BstSEI; 3-4 - N.Bst9I. Enzymes preparations were preincubated at 65° (1 and 3) or 80°C (2 and 4). The maximal level of Bst9I activity is observed in buffers Y and N. Buffer N is also optimal for N.BstSEI, and buffer Y considerably reduces the activity (Fig. 3). Fig. 3 The comparison of N.BstSEI and N.Bst9I activities in different buffers containing the phage T7 DNA: upper row - DNA treated with N.BstSEI; lower row - DNA treated with N.Bst9I. K - untreated DNA, other letters indicate buffers. Three reactive mixtures containing 1, 2 and 4 enzyme activity units were used for each buffer (from left to right). The presence of an additional hydrolyzing activity in N.BstSEI as compared with N.Bst9I is the most important difference in the properties of the enzymes. As Fig. 4 shows, the addition of some redundant N.BstSEI into the reaction mixture causes additional fragmentation of the substrate DNA. Previously we supposed that N.BstSEI evolved from the restriction endonuclease recognizing the same nucleotide sequence 5'-CAGTC-3' . Really, a few restriction endonucleases recognizing and hydrolyzing the DNA at the site 5'-CAGTC(4/5)-3' have been detected . It is easy to see that the recognition site and the DNA hydrolysis site at the upper chain for such restrictases coincide with those for nickases BstSEI and Bst9I. Fig. 4. Fragmentation of pBR322 DNA linearized by Ama87I after treatment with redundant amounts of enzymes and restriction endonucleases PpsI. The number of enzyme activity units in the reaction is given. The last band is the fragment length marker for λ/Bme18I DNA. The work obtained financial support from the Civilian Research and Development Fund under the subprogram "Human Genome". Roberts, R.J., Macelis, D. II Nucleic Acids Res. -- 2000. - V. 28. -P. 306-307. Abdurashitov M.A., Belichenko O.A., Shevchenko A.V., Degtyarev S. Kh. II Molec. biol. - 1996. - V. 30. -N 6. -1261-1267.